Books have dedications, most web sites don’t. But traditional black powder hunting is not your everyday variety of outdoor activity. The pastime’s reliance on history and tradition seems to beg for a moment of solemn reflection; and at the same time, looking back puts one in the frame of mind to contemplate the future, as well. 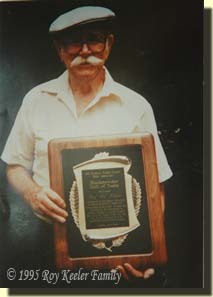 Roy Keeler on his induction into the NMLRA’s Black Powder Hall of Fame. Roy Keeler family photo. Used by permission. In the early 1980s, I don’t recall which year, my nearly-new Northwest trade gun proved a source of constant frustration. The flintlock’s learning curve was steep, my attempts at trial and error problem solving stalled, and I finally realized I needed to ask for help. One early-fall day, trade gun in hand, I knocked on Roy “Pa” Keeler’s backdoor. In typical fashion, Roy stopped what he was doing and spent several hours tutoring me on the finer points of managing a flintlock ignition system, the versatile loading possibilities a smoothbore offers and a quick course on black powder safety. I remember walking away thinking I learned more from “Pa” Keeler that afternoon than I’d learned in the previous half-dozen years. In the weeks and months that followed I had similar experiences with Dean King who was a Michigan field rep for the National Muzzle Loading Rifle Association. Likewise, Dean stopped what he was doing and devoted all of his efforts to helping me unravel a shot patterning problem with the cylinder-bored Northwest gun. During one phone conversation, I remember hearing Dean’s wife, Pat, in the background quietly saying, “Dean, we really need to go,” but Dean didn’t cut his lesson short. Another time, Dean suggested I contact Max Vickery, a past president of the NMLRA and devout shotgunner. It took a few minutes to get over Max calling me “Honey,” not knowing he referred to everyone as “Honey,” but before our conversation ended that problem was solved, too. And in a few days a small box arrived at the post office, filled with cork, felt and fiber wads, compliments of Max. This is the spirit of friendship that flows throughout the black powder community. Roy, Dean and Max have passed on, but their legacy lives on. With heartfelt gratitude, this web site is dedicated to the countless men and women, past and present, who set aside their own needs to mentor a newcomer or assist a fellow traditional hunter. During the first full year of the traditional black powder hunting feature series, I learned that my nephew, Joe, who was 12-years-old at the time, checked the mailbox when the current issue of Woods-N-Water News was due. David said Joe couldn’t wait to read “Uncle Denny’s latest story.” That was a humbling experience that shaped my writing perspective and had a lasting impact on my style. 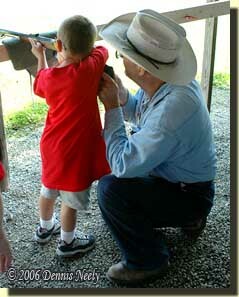 The late Don Thornton shared his love of muzzleloading with many youngsters at the 2006 NMLRA Youth Shoot. In September of 2007, a shy, 10-year-old youth stood off to one side of our traditional hunting camp at the Woods-N-Water News Outdoor Weekend. My wife, Tami, was available before I was, so she introduced herself to Andrew and his family. At the first opportunity, Tami escorted the young man to me, saying “Andrew reads all of your articles, and his family drove a long ways so he could meet you.” I found it hard to fight back the tears when I realized my words held such importance for Andrew. We talked for some time; Andrew wore my top hat with the beaded hat band as we rummaged through the camp’s artifacts. With his dad’s permission, he hefted ‘Old Turkey Feathers,’ and as he held the Northwest gun, I demonstrated how the lock’s mechanism worked and pointed out the turtle sight. I was impressed with the young man’s enthusiasm, his thoughtful questions and his straight forward approach, so filled with unbounded exuberance. His presence served as a lightning bolt, invigorating my own spirit and firing my passion to share the old ways. Like hearing about Joe’s trips to the mailbox, meeting Andrew left me thrilled, humbled and dedicated to be ever mindful of young readers, our future hunters, modern or traditional. Therefore, this web site is also dedicated to encouraging, educating and nurturing the next generation.